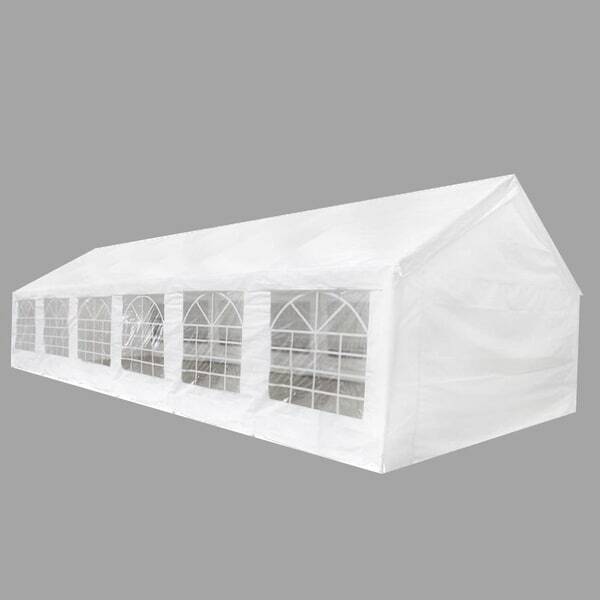 This party tent will be ideal for any outdoor event, such as a show, wedding, party, BBQ, camping trip, festival and so on. You can also install it in your backyard as a large sunshade for your family and guests. It is hard-wearing enough to be suitable for outdoor use year 'round. Made of 100% PE material, the party tent's cover and side panels are UV protective and waterproof. There are 2 window panels with 6 decorative windows each, and 2 door panels, each with a zippered, roll-up doorway for easy entrance. This frame is manufactured from rust-resistant steel and thus highly durable. Assembly is really easy. Delivery includes a canopy top and four side panels, a steel frame and stakes and ties! 2 Sides of 20' x 6' 6"
2 Panels of 40' x 6' 6"
Tent was as described. Doesn't leak. It did arrive with some bent structure members, but vendor took care of problem immediately. Goes up easy, but be careful with the wind. the metal overhead structural pieces work well, but seem to be a bit lightweight. "How many people's inside that tent "
none. We can't put tent up. upon receipt of tent and opening the boxes (there were multiple boxes), one of the boxes contained BENT poles. We've called overstock multiple times to get problem rectified with promises of new tents. We've received nothing, therefore the answer is Zero. We can put the tent up. I meant new poles. we received the several boxes including tent, poles, etc. one of the boxes contained BENT poles. Overstock was contacted multiple times with the promise that replacement POLES would be sent. this has never happened, therefore we cannot erect the tent. "Can you sell only the top cover"
No, this can only be sold as you see on site.